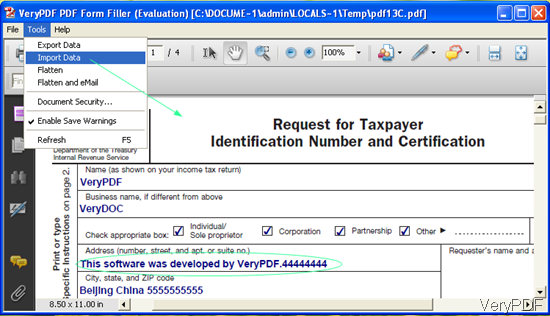 How to fill PDF form by FDF? Question: Hi. Hopefully you can help us out. The Customer will fill in data into a predefined PDF file/form and we want to be able to extract the data elements from customer inputs. Any help would be appreciated. Thanks in advance. Solution:We have two software which can help you do this job. One is VeryPDF PDF Form Filler Command Line and the other is VeryPDF PDF Form Filler. The former one is the command line version and the other one is GUI version. You can choose one of them according to your needs. Detail operations of those two software. First, free download PDF Form Filler Command Line to your PC. When downloading finishes, please unzip it and open MS Dos Windows. Second, check its readme.text and know the basic usage. Find the relative parameters for this conversion. -createfdf : input a single PDF and generate a FDF file suitable for “-fillform”. Third, this work should be processed from two steps like I showed in the above command line. At first, you need to extract the data to fdf file then use the fdf file to fill the PDF form. If you feel the command line is a little complicated for you , here I will show you another filling PDF form way by interface software. First, download PDF Form Filler to your PC. Its usage is the same as the other GUI version software. If downloading finishes, please install it and allow it to run in your PC. When the installation finish, an icon of this software will show up on the desktop automatically. Second, double click its icon to enter its interface. Let us know a little bit more from the snapshot of its interface. All the red buttons are functional buttons. By this software, you can fill the PDF form casually. But if you want fill PDF form in batch, the following way is better->Export Data(there will be a fdf file produced)->edit the PDF form information in the fdf file->edit fdf file then import data in fdf to PDF from. By this way, you only need to alter the some different parts and the same part can be saved. Third, now let us have a check how to edit the fdf file by the following snapshot of a random fdf file. 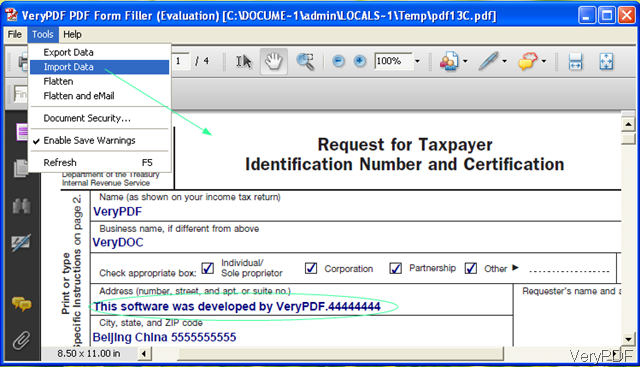 You just simply edit the content in the fdf file then you can fill it in the PDF form. Forth, import the data to PDF form by clicking the button Tools->Import Data-Choose the FDF file. From the following snapshot, we can get that all the date in the FDF file have been imported into the PDF form. Now those ways about filling PDF form by FDF file have been introduced above, if you have any question, please leave us a comment then we will reply you at the first time. If you need to develop more software about file format conversion, please visit VeryPDF official website. How can I copy annotations/highlighting from one PDF to an updated version of that PDF? One Response to How to fill PDF form by FDF? I tried to use PDF Form Filler Command Line to fill my forms from xfdf files. I am using czech language with special czech letters. Unfortunately when I use your SW I can not see these letters in the output file. When I click to some form field in the poutput file I can see these letters, but when I click to another field these special letters from the first field come to invisible. Please can you advise me? I really need SW like yours and I want to buy it.